Register Log In Primarily Petroliana Shop Talk Forums Known & Suspected Unmarked Petro Reproductions Red Indian real or fake? 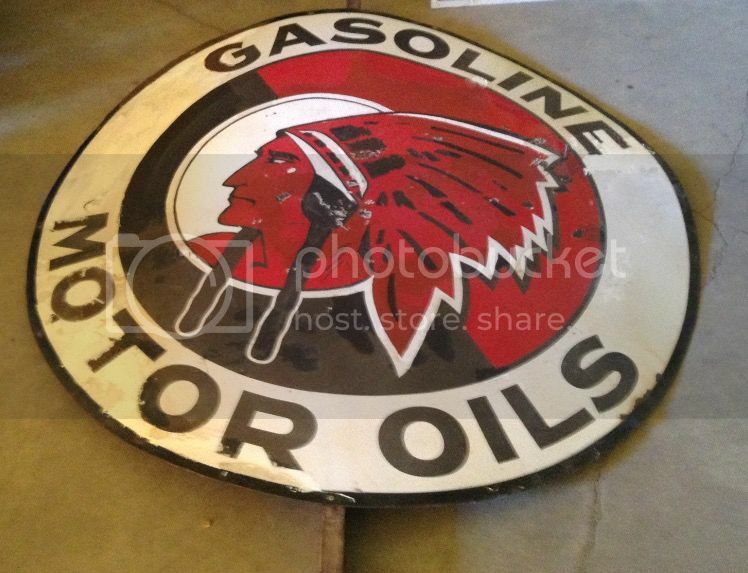 Having a hard time telling if this red indian is real or fake, it has had its edges repainted at some point according to the seller, specifically under the R where you would often see a makers stamp. It's in bad shape but it's a Red Indian. size ? it looks right from the angle of your picture . A lot of these did not have makers marks . It is indeed a 5 footer, that's good to know that I'm not walking into a fake, I've gotten a bit paranoid about reproductions as of late. Would you have a guess on the value of this sign? I know it's hard to tell from one picture but it's all I have to go on right now. It's apparently been painted over in several spots and as you can see, was run over at some point in its life. I know it's hard to tell but even a ballpark number would be a great help. anything in a 5' minty 10,000-20,000 . That shape 1500-2000 . I finally got around to seeing it in person, about %60 of the porcelain was missing, touched up with flat latex house paint. Certainly did a good job of making it look nice in the picture. Was asking around $3000.